leaves that keep trying to summarize my life. Under the brain's white coral is a seething anthill. You had such a deep faith in that green water, once. of the wandering medusa: friends and poisons. But to curse your birthplace is the final evil. a fisherman throwing away fish guts outside his hovel. comes bobbling back with its question, its empty hook? blätter die weiter versuchen mein leben auf einen nenner zu bringen. Unter der weißen koralle des hirns wimmelt es vor ameisen. Du hattest einen felsenfesten glauben an das grüne wasser, einmal. der ranken einer dahintreibenden meduse: freunde und gifte. Aber das gröbste übel ist den eigenen geburtsort verflucht zu heißen. ein fischer der fischgedärm aus seinem schuppen schmeißt. zurückgehaspelt kommt mit einem leeren haken, einer frage? Aus: Derek Walcott: Mittsommer / Midsummer. Zweisprachige Ausgabe. Aus dem karibischen Englisch übersetzt von Raoul Schrott. lapai, kurie vis bando apibendrinti mano gyvenimą. Po baltu smegenų koralu - įniršęs skruzdėlynas. Taip viltingai tikėjai šiuo žaliu vandeniu kadaise. klajojančios medūzos ūselis: draugai ir nuodai. Tačiau prakeikti savo gimtinę yra galutinis blogis. žvejys, metantis žuvies vidurius lauk iš savo pašiūrės. apmaudžiai grąžina savo klausimą, savo tuščią kabliuką? listi, ki se trudijo povzeti moje življenje. Pod belo koralo možganov vre mravljišče. Bil si tako globoko zaverovan v tisto zeleno vodo, nekoč. klateške meduze: prijatelji in strupi. Preklinjati rojstni kraj pa je poslednje zlo. ribič, ki pred kolibo odvrže ribje drobovje. brbotajoč vrača s svojim vprašanjem, praznim trnkom? اما دشنام دادن به زادگاه ات بدترین گناه است. Derek Alton Walcott was born Jan. 23, 1930, Castries, Saint Lucia, one of the Windward Islands in the Lesser Antilles. The experience of growing up on the isolated volcanic island, an ex-British colony, has had a strong influence on Walcott's life and work. Walcott is of mixed black, Dutch, and English descent. Both his grandmothers were said to have been the descendants of slaves. His father died when Derek and his twin brother were only a few years old. His mother ran the town's Methodist school. After studying at St. Mary's College in his native island and at the University of the West Indies in Jamaica, Walcott moved in 1953 to Trinidad, where he has worked as theatre and art critic to periodicals in Trinidad and Jamaica. He began writing poetry at an early age, at the age of 18, he made his debut with 25 Poems in 1948, but his breakthrough came with the collection of poems, In a Green Night in 1962. He studied theatre at Jose Quintero's acting school in New York City in 1958-59 and founded in 1959 the Trinidad Theatre Workshop which produced many of his early plays. He lived thereafter in Trinidad and the United States, teaching for part of the year at Boston University as a professor of poetry and playwriting. Walcott won the prestigious MacArthur Foundation "genius" award in 1981. Walcott is best known for his poetry, beginning with In a Green Night: Poems 1948-1960 (1962). This book is typical of his early poetry in its celebration of the Caribbean landscape's natural beauty. Walcott expresses his feelings of personal isolation, caught between his European cultural orientation and the black folk cultures of his native Caribbean. Midsummer (1984) explore his own situation as a black writer in America who has become increasingly estranged from his Caribbean homeland. In his book-length poem Omeros (1990), which has been critically praised as Walcott's major achievement, he retold the dramas of Homer's Iliad and Odyssey in a 20th-century Caribbean setting. Soon after, Walcott was the third black to receive the Nobel Prize for Literature (1992). Walcott taught literature and writing at Boston University for more than two decades, publishing new books of poetry and plays on a regular basis and retiring in 2007. But in 2009, Walcott began a three-year scholar-in-residence position at the University of Alberta and from 2010 to 2013 he was Professor of Poetry at the University of Essex. As a part of St Lucia's Independence Day celebrations, in February 2016, he became one of the first knights of the Order of Saint Lucia, granting him the title of 'Sir'. Walcott died, at the age of 87, at his home in St. Lucia on March 17, 2017. A Poem in XII Cantos. The Castaway and Other Poems. The Gulf and Other Poems. [New York: Farrar Straus Giroux]. The Caribbean Poetry of Derek Walcott. And the Art of Romare Bearden. Aus dem Englischen von Klaus Martens. The Odyssey : A Stage Version. Aus dem Englischen von Konrad Klotz. Aus dem karibischen English übersetzt von Raoul Schrott. [Henri Christophe/Drums and Colours/The Haitian Earth]. 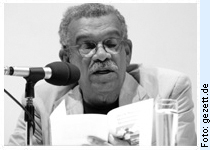 More poems of Derek Walcott in original and english translations and further information about the poet.